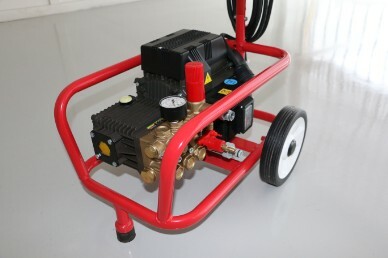 A mobile commercial cold water Electric pressure washer suitable for a wide range of applications including vehicle cleaning and agricultural applications. This is a robust & reliable Italian made (Not Chinese) electric pressure cleaner with a low speed motor that reduces the wear & tear on the pump & increases product life substantially & provides serious value for money. Standard features include Brass pump, a pressure gauge & Pressure adjustment knob. This machine is ideal for owner operators or small to medium businesses looking for a professional and reliable machine. Mainly used in manufacturing, hospitality, automotive, transportation, educational and commercial cleaning industries.